2015 has been a thrilling year for Search Engine Optimization. The year saw the much-awaited Mobilegeddon update, which penalized websites that ignored mobile compliance, followed by a new quality algorithm for content and a bunch of other minor updates from Google. Now, as Google plans to revamp its algorithms, it’s time to get ready to bring in a refreshing change into your SEO strategy as 2016 rings in. 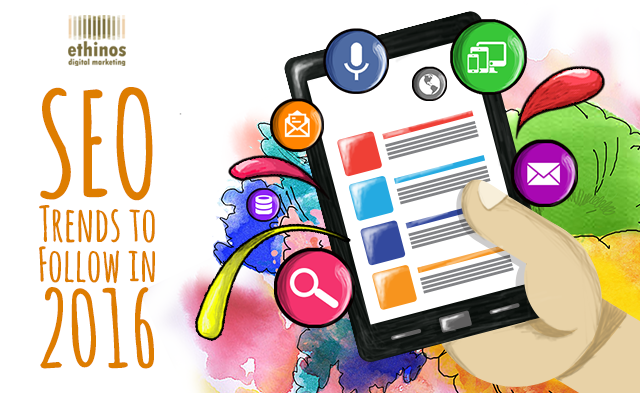 Let’s have a look at the top SEO trends that will create buzz in the coming year. 1.Rich Answers Will Get Recognized: Direct answers to search queries that show up in the search engine results pages (SERPs) are known as rich answers. If your SEO strategy depends on non-proprietary content lacking in rich answers, Google will lower your website ranking. But, if you have unique, high quality content that will enable Google to answer searchers’ common queries, rich answers are for you. According to a recent survey, Google uses external data (i.e., not its own) for 75% of its rich answers. So, here’s how your content will get recognized – do some long-tail keyword research and figure out frequently asked questions in your domain and create answers that address those questions. 2.Focus Will Shift on User Behavior: In order to fulfill the searchers’ needs, though Google has been secretly adopting the user-centric approach for a while, the focus on user behavior is about to broaden now. Combining the traditional Google-oriented SEO with the latest searcher-oriented SEO and focusing on the four major factors related to search behaviors – clickthrough rates, engagement, well-rounded content and social signals could help influence the ranking. 3.App Store Optimization Will Become Prominent: Mobile apps accounted for 52% of all users’ time spent online in 2015. Thus, App Store Optimization is definitely going to be a buzzword in the coming year. More and more organizations are likely to run in-app A/B testing to test their plan and get it rolling. Furthermore, in order to considerably enhance the overall visibility and relevancy of an app page, deep linking will become important in the near future. Whether your app is successful or not will depend on factors like app open rates, conversions, and more. 4.Mobile Will Continue To Lead: Mobile is about to revamp the search ecosystem of the world. More and more people are buying smartphones to compare, choose and buy online products. This means businesses need to go mobile as well if they want to effectively communicate with their audiences and make mobile-friendly websites which will be easily accessible by them on the go. Though people are still habituated to browsing online on a desktop and then moving on to the smartphone for deals, mobile is indeed the future. 5.Voice Search Will Be Prevalent: With the increasing importance of mobile search, the usage of voice search is also expected to grow. Nowadays, people dislike typing while they are on a move; which means there’s a possibility that they will simply be vocal and ask Siri, Google Now or Cortana to help them with their search. Understanding these upcoming trends will help you streamline your SEO efforts in 2016. To add to the above list, read this interesting article on How Slow Website Burns a Hole in Your Pocket.